CARAQUET, N.B. -- October 13, 2010 -- Leo Joseph Mallet, 72, of Six Roads, New Brunswick pleaded guilty on October 12, 2010, in New Brunswick Provincial Court in Caraquet, under the federal Species at Risk Act for disturbing Piping Plover (Charadrius melodus melodus) nesting sites. Mr. Mallet was ordered to pay $500 in fines. 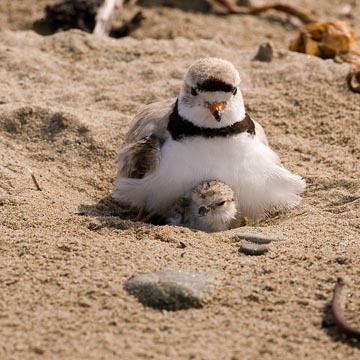 This is the first time in Canada that charges and fines have been issued under the federal Species at Risk Act for the disturbance of Piping Plover nesting sites. This Act prohibits the killing, harming, harassing, capturing or taking of endangered species such as the Piping Plover. The Piping Plover is also protected under the Migratory Birds Convention Act, 1994. On June 2, 2010, Mr. Mallet was operating an all-terrain vehicle on Plover Ground North Beach in Gloucester County, New Brunswick. The presence of all-terrain vehicles on beaches where nesting Piping Plovers are present can have serious consequences for these small shore birds and negatively impact their breeding process. The Piping Plover breeds on the sandy and stony coastal beaches of Atlantic Canada between April and August. The Plover establishes territories, lays eggs and raises young on the open beach between the ocean and dunes. Camouflage is the Plover’s main defence, making the sand-coloured adults, chicks and eggs very difficult to see. The Piping Plover was designated endangered in 1985 by the Committee on the Status of Endangered Wildlife in Canada. The Plover was listed under the federal Species at Risk Act in 2003. Provincial endangered species or wildlife legislation to protect the Piping Plover exists in all of the Atlantic provinces.